Today’s most successful companies need their data to be an easily accessible and structured “single source of truth” in order to make advanced data visualization possible. Conventional data warehouse solutions require complex data preparation or “data wrangling” causing costly bottlenecks and delays in preparing valuable data analytics. Waiting weeks or months to analyze your data in order to leverage actionable, data-driven insights is no longer acceptable. Deploying an on-premises data warehouse requires significant investments in software, hardware and infrastructure setup. 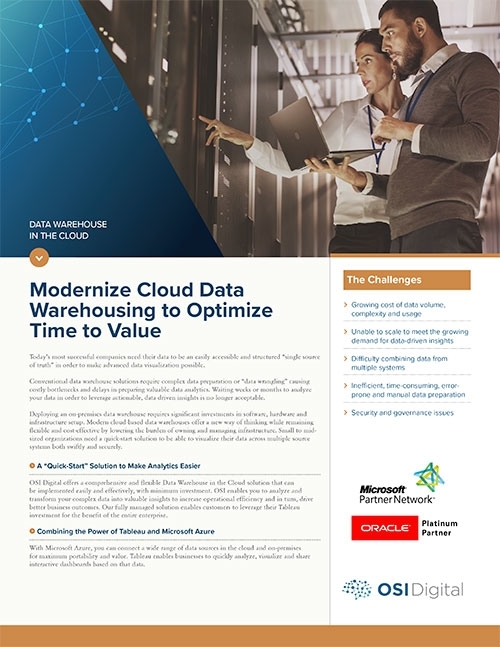 Modern cloud-based data warehouses offer a new way of thinking while remaining flexible and cost-effective by lowering the burden of owning and managing infrastructure. Small to mid-sized organizations need a quick-start solution to be able to visualize their data across multiple source systems both swiftly and securely.